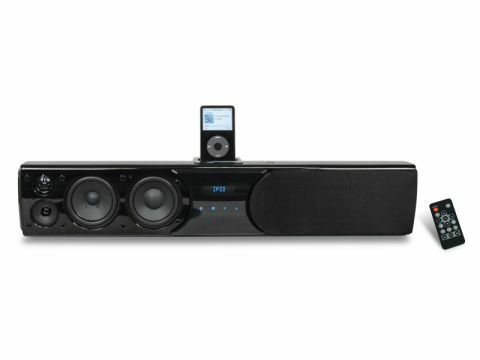 Can a soundbar really best surround sound systems? Renowned speaker brand Crystal Audio joins the soundbar party with the SSB-1, which belts out 200W of home cinema sound from a single unit. Its debut effort sits at the budget end of the market, but steals a march on both with the inclusion of an iPod dock. The unit is robustly constructed and the smart black styling should complement most flatpanel TVs beautifully. At 685mm wide it's one of the most compact soundbars of the bunch, which makes it better suited to smaller TVs. In between the two removable speaker grilles on the front is a display panel that shows the volume, current source and other key settings. Sitting just below that is a row of blue touch-sensitive buttons for up-close control of volume and source selection, plus a 3.5mm analogue minijack for connecting other MP3 players. The selection of sockets on the back is the most generous of the group and includes a composite video output for viewing photos and videos from your iPod, which is a unexpected but useful feature. However, the SSB-1 lacks built-in Dolby Digital and DTS decoding, so when connecting your DVD player via digital electrical you need to set it to output two-channel PCM. Multichannel decoding would have made the SSB-1 even more of a bargain, but some sacrifices were inevitable at this price. To make up for it, Crystal Audio has bunged an obligatory virtual surround sound mode into the mix. This particular technology has been developed by the company's dedicated audio experts and we're hoping for a bit more success than the usual pseudo-surround fare. You'll also find a decent array of EQ modes on board that tailor audio to suit different types of material, plus EX-BASS, which boosts low-frequencies in three steps. Some rudimentary sound adjustments are also available, allowing you to alter the left, right and subwoofer channels. All of these functions are controlled with a credit-card sized remote, that features fiddly blister-buttons, but generally it's a pleasure to use. Dedicated buttons are provided for turning EX-BASS and EQ on and off, as well as playback keys for iPod playback. Inside the SSB-1 are eight speaker drivers and a built-in 100W subwoofer, which combine to deliver a more open and powerful sound than we expected for the money. With a test movie such as The Lord of the Rings, for example, effects are delivered with force, while the built-in sub bellows out bass with more gusto than Brian Blessed at a karaoke contest. We switched on VSS and were reasonably impressed by its capabilities. Swooping arrows and catapulted boulders are flung far and wide across the front soundstage, and you can certainly detect some surround activity buzzing around either side of the screen, but it doesn't sound like it's coming from behind you. The SSB-1's sound quality occasionally betrays its price tag, particularly when high-pitched effects, screeching creatures or clashing metal are played at loud volumes. They have a tendency to sound overly hard. Midrange frequencies are a lot more assured, as demonstrated by clear, crisp dialogue, while the subwoofer inside offers a surprising amount of depth and punch. On a price-to-features ratio the SSB-1 wins hands down.